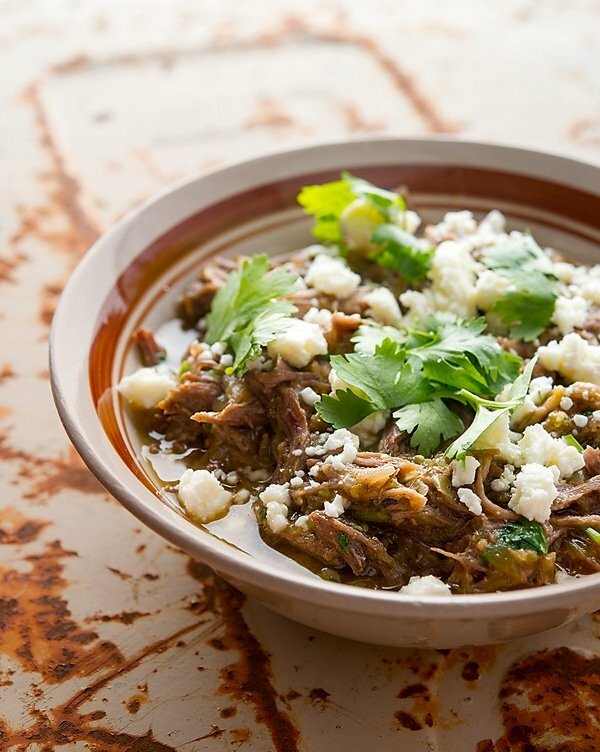 Pork chile verde is my go-to Mexican comfort food. 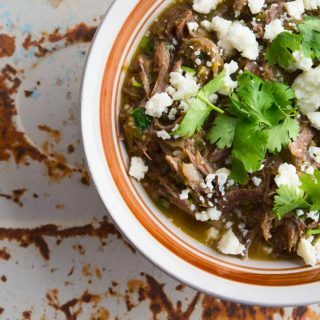 If you’re not familiar with it, it’s braised meat with lots of green elements, like green chiles, cilantro and other herbs, as well as tomatillos. And the tomatillos are the reason that I make chile verde so much. You see, I have these funny little tomatillos that grow in my garden. I never planted them. They just appeared. Lots of gardeners in my neighborhood get them, so I think they are wild, or at least feral. There do happen to be a number of various “ground cherry” species growing all over the country, so I am not certain which one this is. All I can tell you is that this is a welcome weed. So whenever they’re ripe, I pick masses of the little buggers. You can find them in Mexican markets sold as tomatillos de milpa. You strip off the husk, and inside is a kinda sticky green tomato-like thing. When they get perfect, the fruit fills the husk and sticks to it, so sometimes you may need to husk them under cold water. You want tomatillos when they are green and unripe; they turn purple when they are dead ripe. I know of no recipe that calls for fully ripe tomatillos. Do you? Seems weird. When I am inundated with tomatillos, I make loads of my tomatillo salsa verde, which is great on tortilla chips, and can it. Once canned, you have almost instant chile verde. Chile verde, or green chili, is a staple in Mexican restaurants around here. It appears to be a dish from the Sonoran Desert area of Mexico, and there are versions of it all over that country, some using tomatillos, some not. The version we in America are most familiar with seems to have originated on our side of the border in New Mexico. Wherever it comes from, this is a damn good dish, up there with my chile colorado and venison chili. Making the sauce is kind of a production, like most good Mexican sauces. (Ever make mole? Not easy.) You put the tomatillos and garlic on a grill or under a broiler to char, then add roasted green chiles — both hot and mild — cilantro, etc. and chop up everything in a food processor. As I mentioned above, you can do all this way ahead of time by making salsa verde and canning it. Once you have your salsa verde, its easy. Keep in mind that tomatillos are acidic. For geeks, their average pH is 3.8, which is only a little milder than an orange. This means your chile verde will be acidic, too. So go easy on the lime until you’ve tasted it. Meat is up to you. Think pork first, wild or domesticated. Chicken, pheasant, turkey (wild or domestic) are other good choices. Think light meat first, although I will admit, it’s damn good with elk and yes, even things like squirrels or jackrabbits. Play with it! I serve my chile verde with rice, Mexican cotija cheese, cilantro and a dollop of sour cream — and yes, I know sour cream is also acidic, but in comparison to the chile verde, it feels soothing. You can also serve chile verde on tortillas, and a chile verde burrito is damn good. 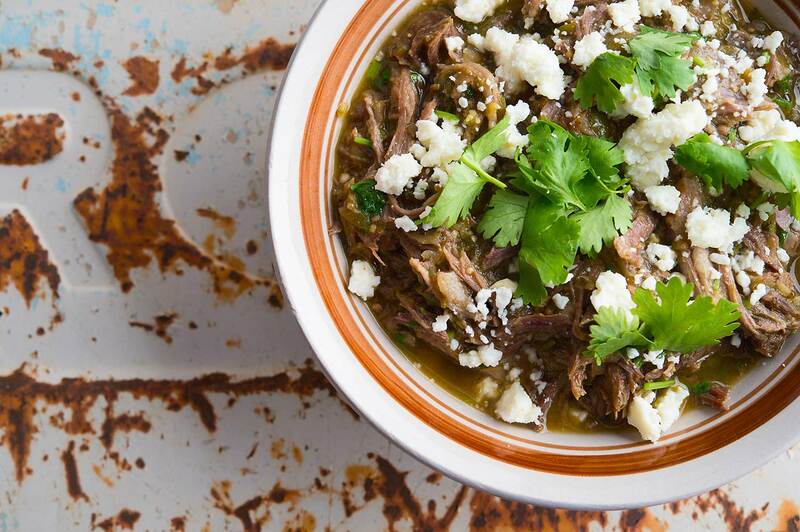 Chile verde or green chili is slightly lighter, zippier version of regular chili. Unlike regular chili, however, it is almost always made with pork, or in my case wild boar. Either will work here. 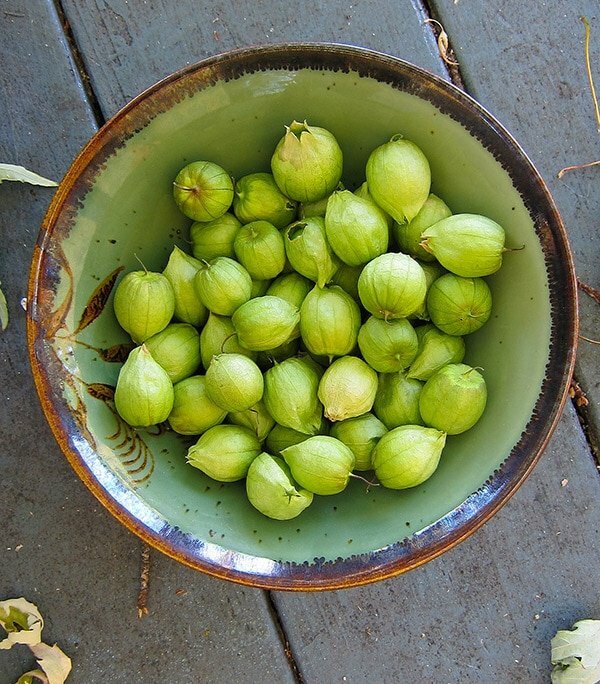 You will need tomatillos here, although green tomatoes can kinda-sorta substitute. You will also need some hot and mild green peppers, too. I prefer fire-roasted jalapenos and either pasilla or poblano peppers, but you can also use Anaheim or, as a last resort, green bell peppers. Keep the pork or wild boar in large pieces -- cut them only small enough to fit into your Dutch oven or other heavy, lidded pot. Salt the meat well and brown it in the pot in the lard over medium-high heat. When the pork has browned, remove it and add the onions. Cook the onions until they get a little brown on the edges. Return the pork to the pot, add the bay leaves, stock and as much water as you need to come halfway up the sides of the meat. Cover pot and cook over low heat until the meat falls apart -- about 3 hours for a wild boar shoulder. To prep the sauce, slice the tomatillos in half and arrange, cut side down, on a foil-lined baking sheet. Put the garlic cloves on the sheet, too and set under the broiler. Remove when they are a little charred, but not burned to a crisp, about 8 to 10 minutes. Put the tomatillos and the roasted chiles into a food processor. Peel the garlic and put the garlic in, too. Add the 1/2 cup of cilantro and a healthy pinch of salt. Buzz until everything is combined but there are still some little chunks; you want texture to the sauce. Mix in the oregano and cumin and set the sauce aside. Fry this sauce in the lard, stirring often, for about 5 minutes. Turn off the heat. When the meat's ready, lift it out of the pot and onto a baking sheet to cool a little. Keep the pot uncovered and turn the heat to high to boil down the braising liquid. Shred the meat with your fingers or two forks. Once the braising liquid has boiled down by about 2/3, remove the bay leaves and return the pork to the pot. Add the chile verde sauce and mix well. Serve over white rice with cilantro, some Mexican hard cheese and sour cream. A note on the chile verde sauce. I make big batches and can it, which is a lot easier. It's basically the same recipe as here, only with a bit of added vinegar. If you're looking for a base recipe, this one is a good start. Once you make this, it will keep for a week in the fridge. You can find all kinds of recipes for wild pork, domesticated pork and even bear right here on Hunter Angler Gardener Cook. The “note” to the recipe mentions vinegar, but I don’t see it on the list of ingredients. I suspect it goes in when the pork is braising and probably about a half a cup ought to do the trick. Mark: Oops. I clarified it. The note refers to salsa verde that is canned, which I add a little vinegar to just to be safe. You don’t need vinegar in this recipe.